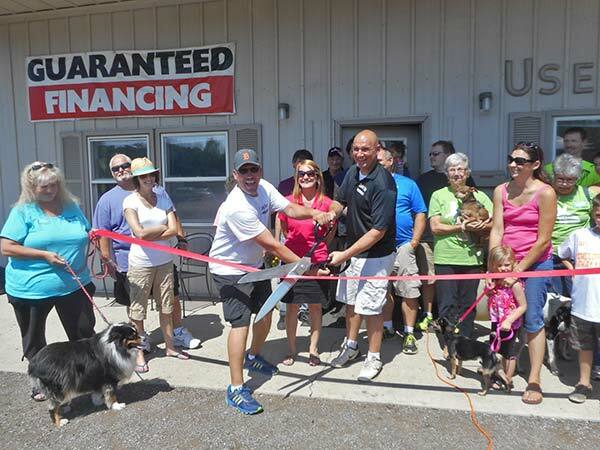 As new members of the Jackson County Chamber of Commerce, Choice Auto Sales of Jackson is celebrating their 10-year anniversary with a public open house and ribbon cutting ceremony. On August 22, from 1-3 pm, the Jackson County Chamber of Commerce will be at Choice Auto Sales, 3570 Ann Arbor Road, Jackson to perform a ribbon cutting ceremony. Following the ceremony will be a family-friendly open house that will include a live radio remote by K105.3, lunch, inflatables, Dunk the DJ tank, games, prize drawings, giveaways and more. The public is invited to attend. Serving the community for over 10-years, owners Chuck Lazarus III and Dave Fiero, have made it their mission to improve the car buying experience. They are not just another car dealership…they treat their customers like family. The salesmen work together – not against each other – to find the right car for the customer’s budget. They specialize in selling vehicles under $10,000. All vehicles are thoroughly inspected by their certified mechanics and get a full detail before they hit the lot. For special financing, they work with a local credit union to help bad-credit customers re-establish their credit without getting gouged on interest rates. Their full-service repair facility offers some of the lowest prices in the state. Both Chuck and Dave have spent the majority of their career in the automobile industry, including detailing, service, financing and sales. They started Choice Auto Sales because they wanted to separate themselves from the typical dealership and create their own integrity-driven lot. They both oversee the operations of the dealership and are hands-on in daily activities.